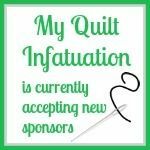 My Quilt Infatuation: February News and a Giveaway! 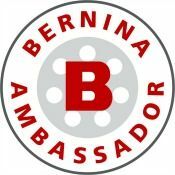 February News and a Giveaway! Happy (almost) Valentine's Day, friends! It's the middle of the month, and that means that it's time for a rundown of the best deals from my favorite shops on the web. Whether you're shopping for yourself or your favorite quilt friend, fabric is always a sweet gift option. This post contains a giveaway as well, so read on for all of the details! First up is Shabby Fabrics! 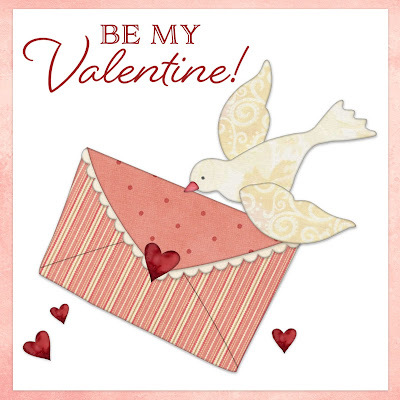 Shabby Fabrics is having a fantastic Valentine's Day sale, but it's a big secret! All I can tell you is that you will definitely want to visit their shop tomorrow to check out the details and take advantage. The sale will have a special coupon code, and will be for one day only, so don't miss out! 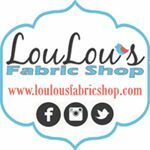 Over at Fort Worth Fabric Studio, there is lots of awesomeness going on! New in the shop is the Sugar Berry Collection by RJR Fabrics. Aren't those prints luscious? 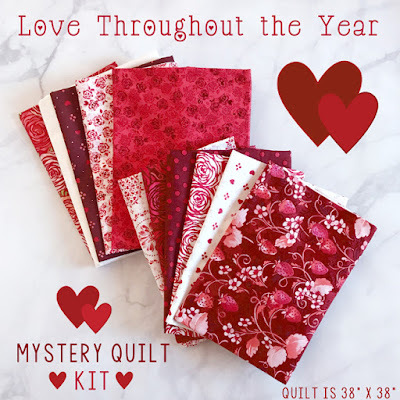 If you're looking for a fun way to add a little Valentine's flair to your home for next year, then check out the Love Throughout the Year Mystery quilt kit HERE. 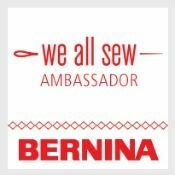 FWFS will be posting all of the instructions for the quilt on their blog, beginning tomorrow, so get your kit ASAP! Did you know that at Fat Quarter Shop, they choose a quilter's basic each month and offer the entire collection at 20% off for the entire month? I always like to keep my eye on the month's special, and really stock up when I can. This month, ALL Bella Solids are on sale! You don't even need a code to get this deal. The sale prices are already posted on their site. If shades of pink aren't your thing, LouLou's Fabrics has a fun, love-inspired bundle with a different palette. Check out this Heartthrob bundle. 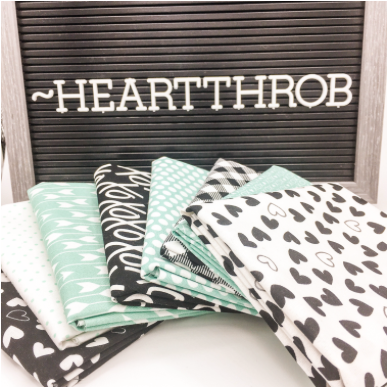 The mint and black combo is super cool, but the prints are still perfect for Valentine's Day! 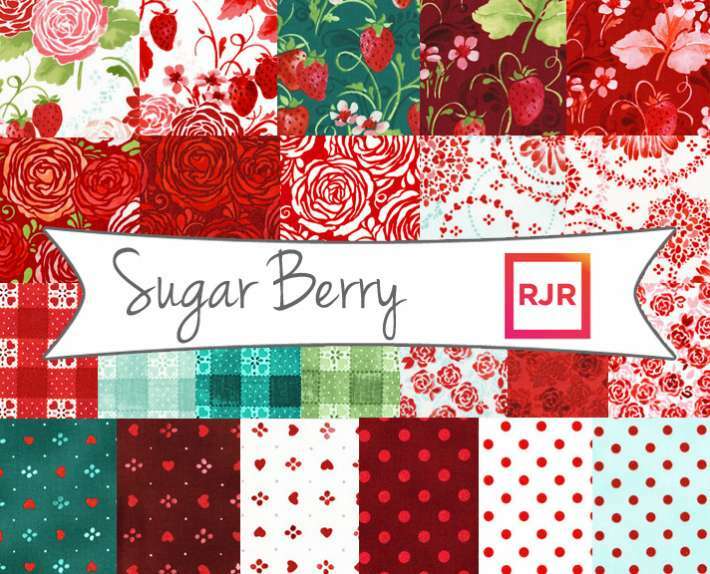 If you feel like getting a jump start for next Christmas (because really, who doesn't stock up on Christmas fabrics, year-round? ), LouLou's has the entire Merry Merry collection by Kate Spain on clearance. The prints in this line are so fresh and pretty, and I think I might have to get some! Last, but never least, is Lady Belle Fabrics. Lady Belle is known for their beautiful bundles, like this beautiful stack of Spectrum by V and Co., and lots of them are priced 20-40% off! That's tough to beat. I've been seeing lots of Liberty lawn projects popping up on Instagram lately, and I also think that Lady Belle has one of the best kept Liberty secrets around. Check out this gorgeous 22-piece bundle on sale. 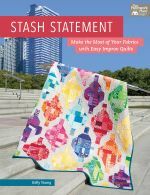 It's a perfect way to try working with Liberty lawn fabrics without breaking the bank. Lady Belle is also graciously sponsoring our giveaway today. One lucky reader will win a $25 gift certificate to the shop! Before you head over to these amazing shops to check out the goodies, be sure to enter the giveaway by leaving a single comment below! Good luck, happy shopping, and Happy Valentine's Day! Have a lovely day tomorrow with lots of warmth and joy Kelly. I love those Spectrum fabrics: I could pet them for ever! There is a lot of pink out there this time of year (and I do like pink) but that Heartthrob bundle speaks to me! Yummy! You need to stop enabling me!! I always have to check out each site and fall in love with something. Have a great Valentine's Day! Thanks for the awesome sale listings. I'd love to win the give away! Wonderful selection of quilting goodness. Thanks for sharing!! Gosh if fabric pining/wanting was an Olympic sport I would definitely be on the medal podium. I have a perfect piece of retro material that will marry well with those Lady Belle fabrics! Thanks for the heads up on the great deals! 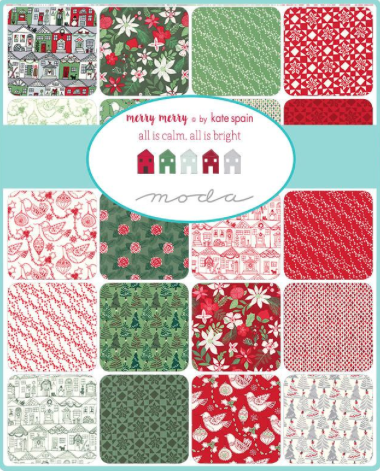 I am going to check out the Kate Spain Christmas fabric -- I always love her Christmas fabrics. Thanks for the chance in the drawing too! Thank you for posting all the sales! That Merry Merry is a great line! Thanks for the information on all of the great deals and for the chance to win some lovely fabric! Love the deals you shared! So many fun shops to visit! Thanks for all the information and the give away! I've been eyeing Liberty Lawn. I would love to win the gift certificate so I can buy some. Thanks! Lady Belle has some seriously drool-worthy fabrics. Thank you both for the giveaway! Sugar Berry and Liberty of London prints have really grabbed my attention. It would be wonderful to purchase some. Thanks for sharing. Great offers from all. I'll be searching tomorrow. A wonderful giveaway. All of those fabrics are lovely. Happy Valentin'e Day to you. 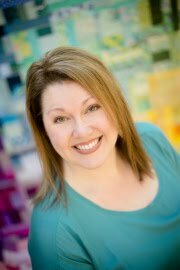 This is Danice from Homespun Hannah's Blog. A wonderful giveaway. All of those fabrics are lovely. Happy Valentines Day to you. What beautiful fabrics, very enticing !! Happy valentine's day to everyone, love is in the air ! I really like your second baby quilt, and the lady belle fabric. Thanks gor the give away. Are you going to post the pattern for the latest baby quilt??? Oh thank you! I love the Liberty fabric, just waiting for an opportunity!! Gah! That Liberty bundle! Thanks for the giveaway! Sponsors, you’re all so generous and I appreciate that. Love anything solid, soft, prints and mysterious ( aka mystery quilt kit) . Kelly you’re generous too. Happy Cupid’s day. Happy Valentine's Day. Thank you for the chance to win FABRIC!!!!!!!!!!!!!!! What pretty fabrics. Happy Valentine's Day. 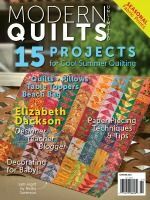 Some fabulous stuff going on in the quilting world!! Thanks for the chance to win some of it. Thank you for sharing these great sales with us! These are all so very luscious!!!! Who would not want to win???? Love your blog! Thank you for sharing this giveaway. There are so many nice selections. Thanks for all of the information. Great colors and prints to think about for next year. Although I think heart fabric is cute all year long! for us out in fabric land... so many to choose from... Wonderful giveaway..
What a fun giveaway opportunity, thank you!! I'm a Liberty Fan! I have a very small variety that will one day be a mini quilt marvel! Happy Valentine's Day! What a wonderful giveaway! 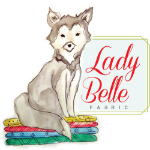 I've shopped from Lady Belle several times - great fabrics, prices and service. Ooh -- always happy for a great giveaway chance. I'll be popping over to these shops to see what's going on. Thanks for the opportunity. Yummy! Such pretty fabric. I'll take it over chocolates (unless it's chocolate colored fabric). Thank you for all the great information. Oh, thanks so much for this. You reminded me of some fabric I need (note the use of "need" v. "want") to stock up on for a BOM I'm working on. To find it on sale is quite a boon. What a lot of fabulous fabrics! So exciting. Thanks so much for the giveaway chance, too! 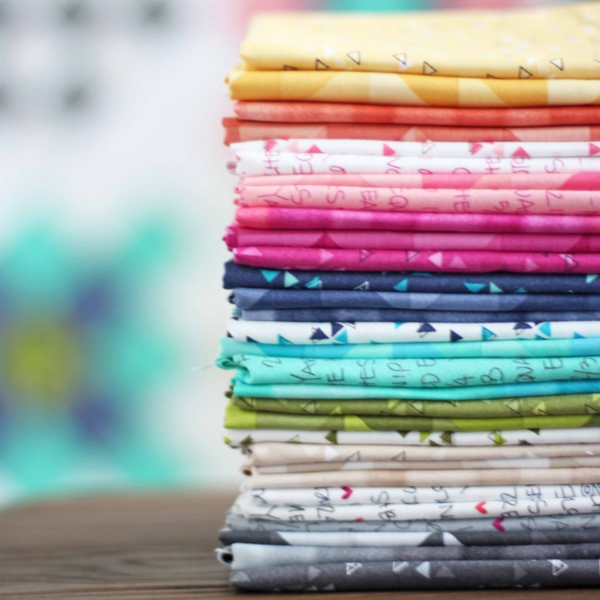 Wow, this newsletter is packed with fabric yumminess! Thanks for the info, and a super giveaway! Thanks for letting us know about these specials. I am off to check them out. Liberty fabrics are so lovely and feel like a dream. I appreciate your notification about the sales at these online shops. I am always looking for sales! And these prints in the giveaway.. I am SSSOOOOO ready for Spring...These make me feel it is here! Thanks for the chance to win them!!! Happy Valentine's Day Kelly. Thanks for sharing all these great stores. thanks for the giveaway - Happy Valentines day to you and your family! Happy Valentines day! Thanking You for a Sweet Giveaway! 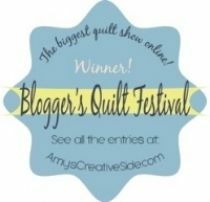 LOvely fabrics and wonderful giveaway! Happy Valentines Day to everyone. Those Lady Belle fabrics look gorgeous. I love how you curate your sponser's specials....verrry tempting! All those fabrics look so awesome. Thanks for sharing them with us and for the opportunity to win something. HAPPY VALENTINES DAY !!! thanks for sharing all the lovely opportunities. Lovely fabric collections. Thank you for the introductions. Wonderful collections! They'd make any quilter/sewer happy! Would love the opportunity to work with Liberty fabrics - thanks for the chance! That Liberty bundle is to die for!! Thanks for the giveaway! Love that mint and grey/black bundle! Not to mention the Spectrum and Liberty bundles. Thanks for the chance to win! to win any Liberty bundles. Thanks to you and them for the chance. Happy Valentines Day Kelly! And thanks for sharing all this gorgeous fabric. I love it all, especially the Liberty! Thanks to you and your wonderful sponsors. 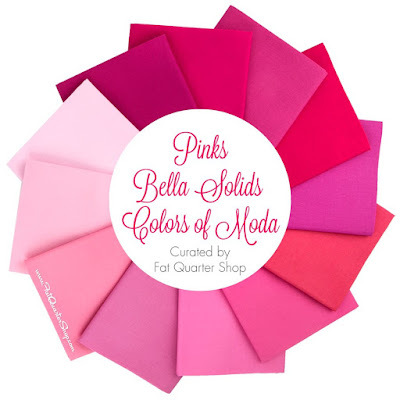 Thank you for sharing the tip on the Bella Solids at FQS. I'm on my way there through your link. I love those spectrum colors. Beautiful!!! I hope your Valentines Day was wonderful. lovely valentines fabrics. Bit early for me to start picking up things for Christmas, I wait til around June. I love the Liberty of London bundle....gorgeous! 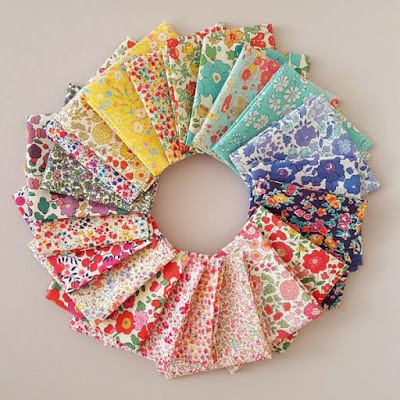 The Liberty fabrics make me so happy! !